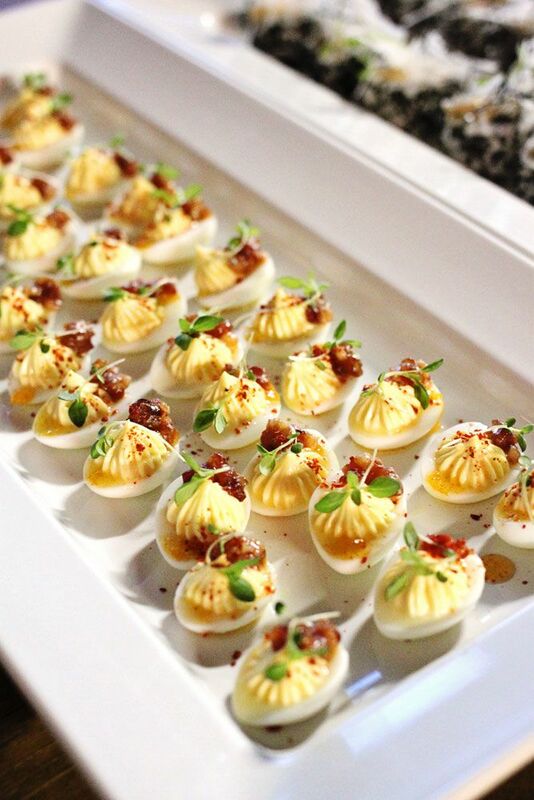 For all you foodie football fans out there, here’s a great way to up the appetizer ante on Superbowl Sunday: Deviled Quail Eggs with Bacon Shallot Marmalade. These little bite-sized morsels will be a BIG hit. If quail eggs are hard to come by, you can always adapt the recipe using local free-range chicken eggs (just be sure sure to add more creme fraishe to compensate). Using a knife, slice the bacon into strips about ⅛" thick. Lay flat and slice ⅛" strips. Turn perpendicular and cut bacon into little ⅛" cubes. Brunjois (fine dice) the shallot. Place Bacon and shallot in a pan over a low heat. Bacon will begin rendering the fat, cooking the shallots. Add the vinegar and sugar and stir with a spoon to create a syrup. Once it has reached a syrup consistency, remove from heat and let cool. It will thicken to marmalade consistency once fully cooled. Reserve for garnishing deviled quail eggs. Bring a pot of water to a simmer. Submerge Quail eggs for 5 minutes in simmering water. Transfer to an ice bath. Once cool, remove from ice bath and gently peel the shells from the eggs. Cut each egg in half length wise. *Keep a half pan of warm water and a towel near to rinse knife blade for clean cuts. Gently remove yolks and place in a food processor. Reserve egg white halves in a bowl of cold water. Puree egg yolk with creme fraiche. Season yolk mixture with salt. Puree until smooth, similar to softened butter. Place filling in a piping bag with a 12 star tip. Remove egg white halves from water onto a dry towel. Pipe egg yolk mixture into the center of the egg. Garnish with Bacon-Shallot Marmalade and micro greens.